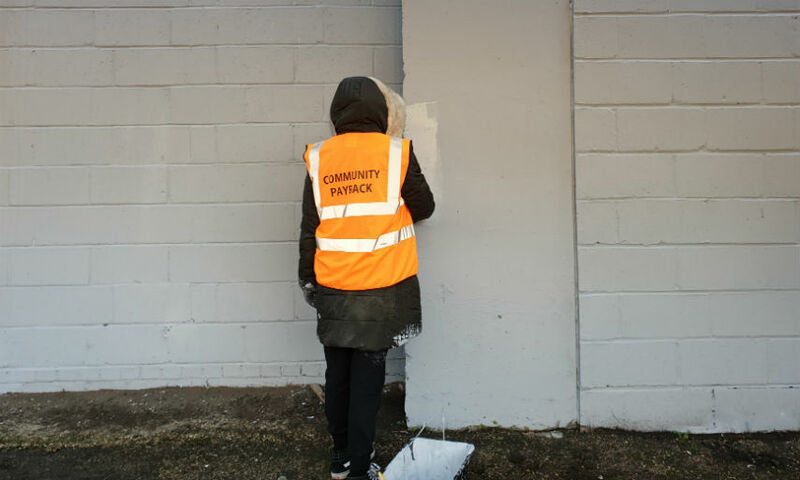 The community payback scheme is for people whose offences require them to complete 200 to 250 hours of community service rather than serve a prison sentence. Each offender is carefully assessed before they are assigned to the scheme. Community payback service user carrying out unpaid work. Byron Blake is the scheme’s supervisor and he supports his team to carry out a range of jobs, from street cleaning, graffiti removal, painting, gardening and much more. Byron’s team has worked on the Council’s Plumstead art project which involved them rubbing down and washing the walls in preparation for the mural painted by Sam Skinner and SLAM of 9thseal - the mural now covers Pettman underpass in Plumstead. They also tidied the surrounding area and cleared away the shrubs and weeds, some of which were over ten feet tall. Plumstead mural commissioned by the Royal Borough. The scheme has a number of upcoming projects across the borough which includes the St Nicholas Church Gardens clean-up project, due to start at the end of March 2019. Cllr Jackie Smith, Cabinet Member for Community Safety and Integrated Enforcement said: “Taking part in this unpaid work to serve your community is a positive step in the right direction for offenders, and some of our local schools, community organisations, charities and communal areas are benefiting from this scheme.